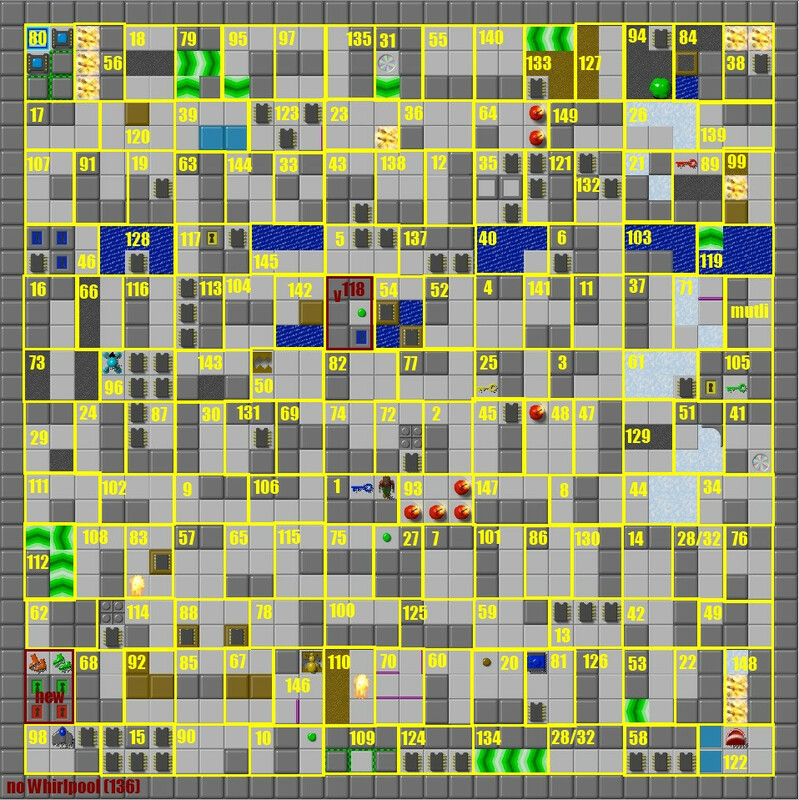 JBLP2 - Under Construction - CC Zone: The Next Level - Chip's Challenge/Tile World website! You can expect to most likely see most of my Create entries for the days to come in this set too, and I'll be using this thread to post more previews as time goes on. Do you have any ideas that you'd like to see me attempt to build? The only stipulation is that everything must be Lynx-compatible - pedantic Lynx preferred. Glad to see this set being in production J.B.! I'm guessing this one is going to be slightly more difficult than JBLP1? As for ideas, I remember you mentioned a 7x7 level concept idea as one of the create competitions for last year but it never happened. Maybe you can pull it off in this set? My first thought is I want to see Run of the Mill again (JL1 #42), and I think you said you'd make an easier version of it. Other things that come to mind are your take on a cypher level and what about a jumble level with throwbacks to your own levels? 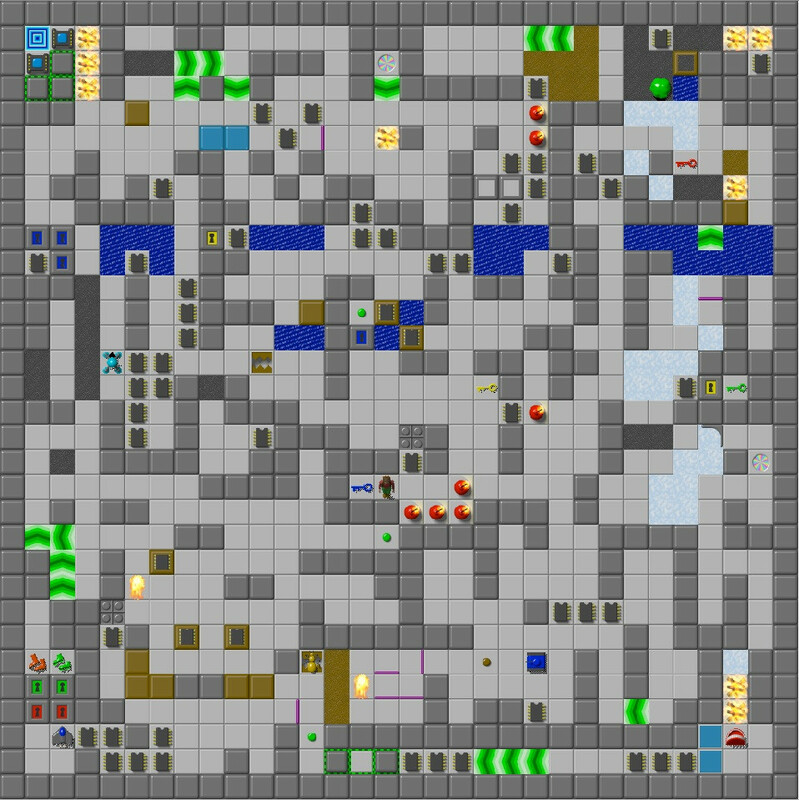 I made a 7x7 level for JBLP1 ("Breathing Room"), but there will be a 9x9 level in this set, which I'll be submitting as a secondary entry for this month's Create Competition. Oh lol I didn't notice well your take on a cypher would be interesting to see actually, as well as a jumble styled one. I hope to see a Scavenger Hunt style level in this set. I've actually been hoping to do a Scavenger Hunt level, but I'd prefer to do it only if it's something interesting. For this set, I'm trying to avoid (at least for the most part) doing levels that are obviously supposed to resemble or remind players of levels they've played. I'll see what I can do, though. It's been a while since I've posted a level preview - here's another one called "Zero Degrees." Looks nice. Just wondering, I expect you have some level ideas that turn into levels that aren't that great, are too hard, or otherwise don't fit into JBLP2. What do you plan on doing with those? Probably archiving them for potential revamping once I've had some time away from them. I haven't posted a preview in a little while, so here's a new one I put together yesterday. Also, It is interesting that your levels are sometimes symmetrical, which is an interesting idea, but the 9x9 grid the player uses sort of defeats the purpose, unless of course they look at it in the editor. Can't wait to see more! I've just posted a 10-level preview of JBLP2 to the downloads section of CCZone. Please check it out whenever you get a chance and let me know what you think! Comments and suggestions are always welcome. J.B. confirmed greatest level designer. titles. I really like Randomonium, Don't Forget to Remember and Jungle Fever. I'm also really curious as to what "goofy golf" will be all about. 1. Perhaps a fair level, the size is very good here for this type of concept. 2. Great level: I like the aeastetics, the concept that is potrayed, and the design seems very well put together. 3. This one is interesting, it is unique in the sense of just using one color, which I like. The last section of the level can be quite annoying when one doesn't understand the clues given though. 4. An intriguing level where the symmertry works very well here. Optimizing this level was very fun. 5. 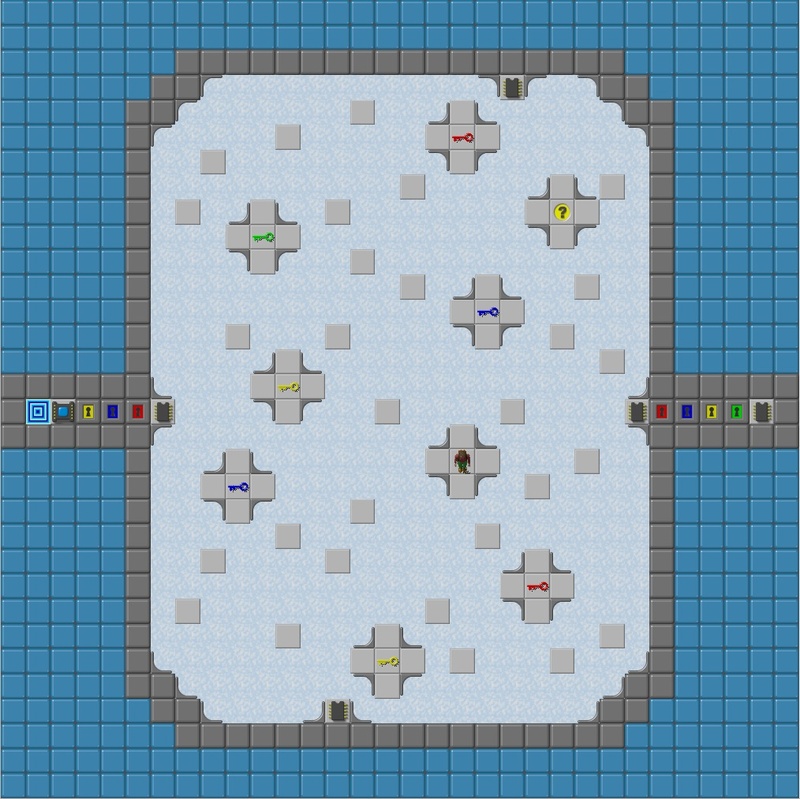 A fairly good ice maze. I kind of wish that the size was reduced by a little though. 6. Nice Chuck's Challenge inspiration, the level has a little bit of guesswork near the end from first glance, but it is fairly easy to figure it out with a little thought. Overall, fun level. 7. This level is certainly something different from what I've seen, I have no idea what to think of it lol. 8. A little bit irritating, but can be managed. The aeastetics are average, with the bottom right section. The blob area was interesting though. 9. This is an interesting take on a joyride concept, but I don't think the entire map is needed to explore this. 10. A good complex level, when using tiles according to color, this level does the concept very well, while allowing a good amount of exploration. Thanks for the feedback, lookatthis. I'll definitely take your comments into consideration as I continue building the set. Here's another preview to whet everyone's appetite, this time for the very first level. My entry in the January Create Competition was loosely based on this. I also had planned on giving some first impressions on the preview set. #1 (Open Door Policy) - A fine level. Quite conservative and no tricks, but that's fine. #2 (Reservoir Frogs) - A great way to use the tile combination of a teeth on a water tile. Kudos. #3 (Five Shades of Grey) - Enjoyed this one too. #4 (I am the One Who Unlocks) - Didn't really care for this one that much. Maybe had to do with all the pointless walking. Did think that the toggle room was a clever implementation of that particular trope. #5 (Zero Degrees) - I don't like levels like this. Maybe it's not the level's fault by itself, but there was nothing new here for me. #6 (Cut to the Chase) - Do you place elements in levels based on the optimal route sometimes? Here it is useful to boost perfectly and am wondering if that was a coincidence. #7 (Spookoban) - I am so glad this isn't any larger. I guess I enjoyed this. I freed like three teeth when going for a better time. #8 (Prehistoric Peril) - If I mess up with the teeth, it would be nice to be able to salvage the situation with a block from below. Why not make this one untimed? #9 (Into the Wild) - Another one that is not up my alley. It was a bit hard getting where I wanted at times when I tried to just flow with the current and wait for the right time. 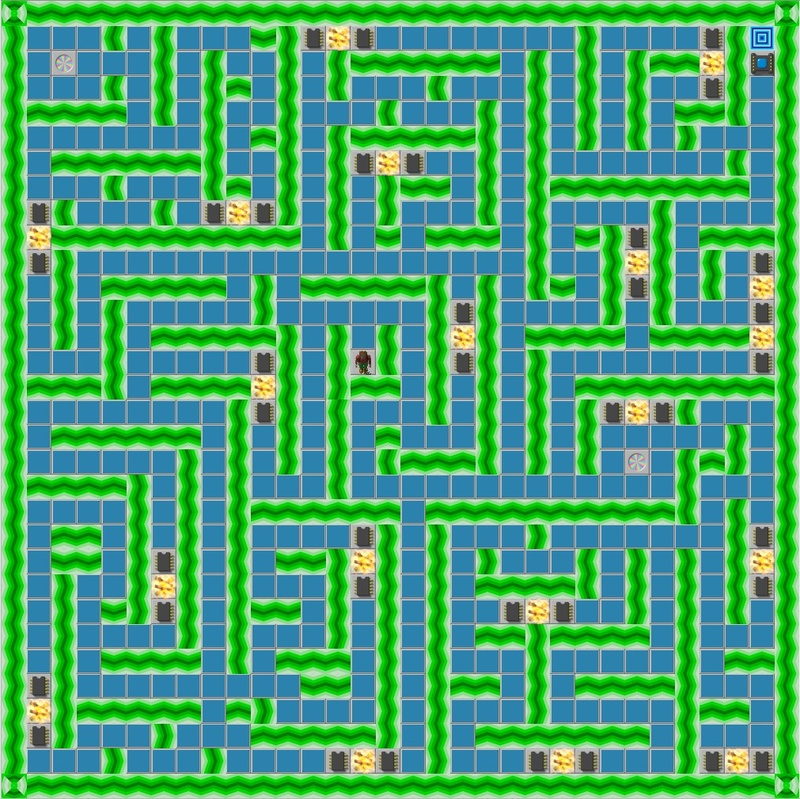 Maybe consider changing the nine tiles at [16-18,13-15] pointing north to help with not getting stuck in that one large loop but have two loops instead. #10 (Color Coordination) - This was difficult enough that I hadn't bothered solving it earlier in the April 2013 create package even though it won. An interesting take on repeating the same wall structure but using different colors. You mention in the description of the download that the set will feature levels seen in CCLP3. I have to ask why? Many of your audience have played CCLP3 (and even JL1) and if new people come around and first play JBLP2 it will not improve their experience with CCLP3 when they decide to try it. Overall I enjoyed playing these levels, so thank you. All the previews also have been exciting. You clearly have made enough levels to understand how players will experience your creations, and you manage to build them interestingly enough for many different types of players, which is not easy. I look forward to the final set. Great level, JB! 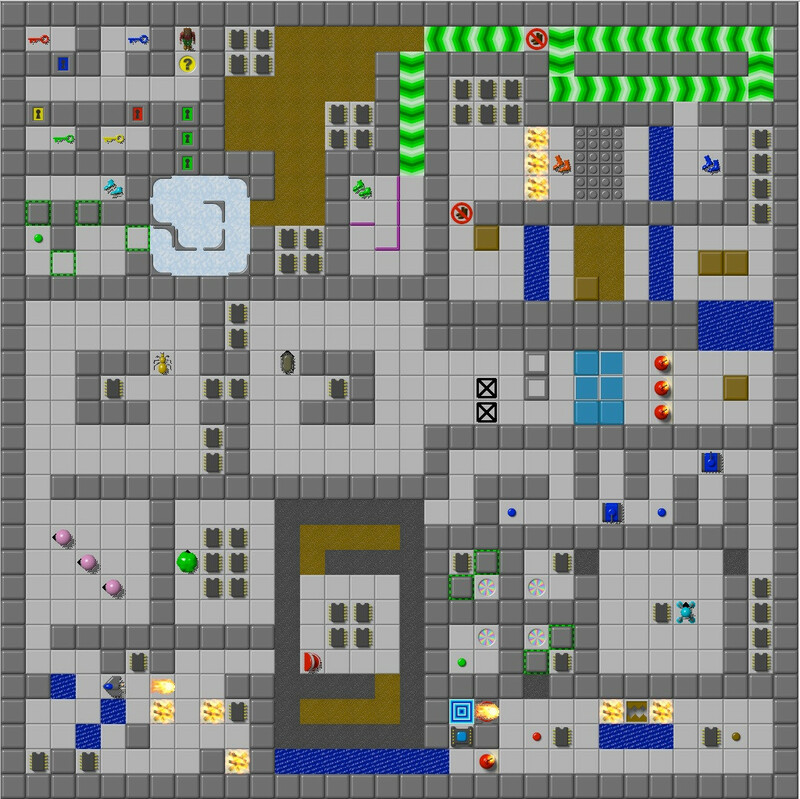 That would make a nice early level - looks like it introduces almost every single tile! Okay, so for those who missed the joke, I'll go ahead and spill the beans here: the above level is not going to actually be in JBLP2. It was a "Jumble"-type level constructed as a CCLP1 clue that features 2x3 pieces of all 149 CCLP1 levels in the exact spots where those pieces appear in the actual levels. The "multi" was originally 49 Cell from my process of elimination, but it cold have been a couple others too. Wow! Impressive! I don't know what happened to Whirlpool - I thought I included every level, plus an "extra" area to fill everything out, which you found. Anyway...I'll go ahead and post a real preview for JBLP2 here that I put on Facebook yesterday! Introducing "Jungle Fever" - a maze with an interesting twist. All righty, everyone - I apologize for the double post here, but I've got an announcement to make. 1. I originally released JBLP1 at 100 levels primarily because CCLP1 voting submissions were coming to a close at the time, if memory serves correctly. I want to establish an even gentler difficulty curve for JBLP1, and a lot of the levels I've created recently will help with that while working in conjunction with the existing JBLP1 levels well. 2. Some of you have wondered why I'm including CCLP3 levels in this set. The reason is that I'm removing JL1 from my levelset "canon," and its levels will either be retooled and fit into a JBLP set or be placed in the forthcoming "rejects" set I plan to release soon. At any rate, they'll be appearing somewhere, and I'd like at least a few CCLP3 levels to appear in this updated JBLP1. 3. Also included in the rejects set will be levels in the current iteration of JBLP1 that have been less well-received, particularly during CCLP1 voting. I'm not referring to levels that didn't make it into the set - just mainly ones that did abysmally. I'd like to replace these with better, newer levels, and this presents a great opportunity to do that. 4. I'd like to update the current JBLP1 levels that made it into CCLP1 with the changes - minor and major - that were made to them during the CCLP1 process, as well as redo some of the aesthetics in some of the other levels. A complete set overhaul is a great time to do that. 5. I will not have the time over the next few months to build another 50 or so levels. I'd like to go ahead and release these levels I've been working on before a lot of big things happen in my personal life that are supposed to happen fairly soon. So I should have this new JBLP1 ready for release soon. Hang tight - I'll make another announcement in the near future.